If a teacher gives even the slightest signal that it’s time to go outside, kids hop up and bolt for the door. That’s true most of the time. So, this morning, when I got a distress call from Ms. Weathersby telling me that Tarik “is being difficult again. He doesn’t want to go out to play” I knew she shared only one part of the story. I hung up the phone and headed to the classroom tip-toeing through the back door, silent as slipper toes. I watched as twenty children who, at the teacher’s signal, scrambled toward the front door. But Tarik, the twenty-first child, remained apart. From the back, I saw his curly black hair. He sat on the table top, hands gripping the table’s edge. He kicked a chair, a book shelf, and the table just hard enough to make noise. “Get your feet off my chair, little boy. Stop kicking my shelves. Don’t touch my things.” Then, her eyes locked on mine for a rich instant. She spoke again: “He is having a bad day. You handle him. I’m taking my students outside.” She exited with entourage in tow. I pulled up a tiny chair and sat next to Tarik, asking him what he had been asked to do. He showed me a single page, stuffed with a dozen images of bears, mountains and little people. He wrote “Puff the Magic Dragon” and asked me how to spell “Dragon.” I spelled it out on my hand and he copied. He then signed his name. All of his letters faced the right way! Job well done, from my point of view. “And your letters are perfect! I’m proud of you.” Singular praise, the fact that I gave it, unraveled the knot from his brow. He lifted his head and looked at me. Away he went. And though the teacher did not greet him when he arrived at the circle, that snub did not stop him. He nudged his way in at just the point he chose. I am here, I matter, I know you can see me. Clear, efficient communication. I appreciated that about this boy. How long the odds that the teacher received the message. I turned to go, considering how the boy had turned his day his way. 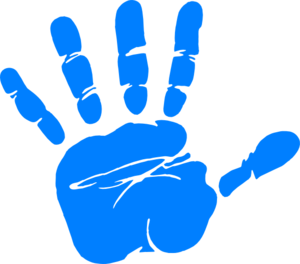 One hand print, waiting in the “done” box – a message to a grown up to see him. For now, his approach addressed the barrier with pure poetry. Where to begin when we have so far to go.